Earlier this year, we moved our Cambridge-based studio into a building in Central Square. We wanted to personalize our new home with some public art, but were uncertain about what final expression it should take, so we got started by slapping on a new coat of paint—transforming it from an oppressive gray brutalism to a welcoming white canvas. Then, a local connection, who shared our desire for more street art in Cambridge, suggested we look up Eltono. The building as it looked before we moved in, and with Eltono's mural, now. Eltono coincidently was on our inspiration mood board so we knew we must connect. At the same time our studio was revisiting work by an artist-nun named Corita Kent. We found her work and process deeply inspiring to our culture. 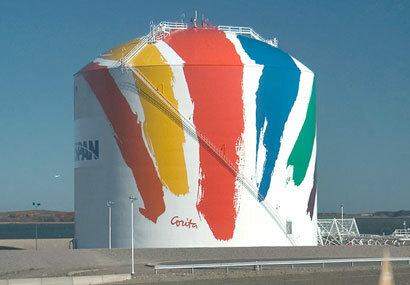 There's a backstory worthy of telling here: In 1971, Boston Gas Company commissioned Kent to paint a mural on a gas tank in her new hometown of Boston. The work, known as Rainbow Swash, is a simple commentary on the nature of painting and minimalist joy, a six-color combover on the bald head of a stout roadside tank. Kent was an unlikely candidate. For nearly two decades, as a nun in the Sisters of the Immaculate Heart in Los Angeles, she had pushed the edges of acceptability as an artist, teacher, and activist. Her work, now recognized in the Pop canon alongside Andy Warhol and Roy Lichtenstein, challenged cultural norms by reappropriating common packaging and advertising slogans and setting them alongside passages from the Bible, pop music, and classic literature. Artwork by Corita Kent. Left: American Sampler. Right: Manflowers. As counterculture gained momentum, and Kent used her art to advocate for justice and peace, her profile grew and her messages sharpened. Eventually her protest was too much for the Church to handle, and they mutually separated, leading Kent to make a move to Boston and continue her art. But something changed in 1970. While her activism persisted, a new body of work arrived, with simple brushstrokes and appeals to love each other. Artwork by Corita Kent: Very. It was this moment that, 15 years later, culminated in her iconic USPS Love stamp, and also led to the commission from the Boston Gas Company. Today’s headlines are a 1960s deja vu: culture wars, social injustice, sexual harassment, mass shootings, covert ops, media corruption, political failure. It’s easy to draw parallels to Kent’s day, and to find artistic expressions in response (Shepard Fairey comes to mind). But I’ve personally wondered how Kent made the shift to rainbows and love, and I mean that with no irony. Maybe it comes down to this simple truth: Love wins. While Kent was popular in her time at Immaculate Heart, even landng on the cover of Newsweek, she didn’t achieve true household status until her 1980s USPS Love stamp. It’s the message we all needed, and it’s still the message we want today. The French Muralist, Eltono, has worked in over 90 cities, including recent stints in Madrid and Beijing. He now lives in southern France. Eltono has done installations in more than 90 cities around the globe; each unique, but connected by a calculated joy. His work is made from randomly placed forms inspired by the architectural elements of the site. Though we had yet to meet, his work felt right—a cosmic alignment of our values. And once we did share ideas, we were stoked, except about one thing—color. Maybe it comes down to this simple truth: Love wins. Eltono’s choices were exuberant and bright. Colors inspired by Mediterranean sun, French countrysides, and European sensibilities. They are radical for hidebound New England, an area known for its pilgrim stoicism, and not native to a region that is white and gray for five months of the year. We quietly fretted about what to do, how to discuss the issue with him. Then I was reminded of Kent. Of her joy in the face of adversity—love and rainbows. We didn’t change a thing. In fact, we wore the colors—in the form of paint splatters on our faces—with pride! Eltono invited help not only from other muralists, but also from IDEO families and neighborhood kids. His colors greet each passerby’s smile with their own. Each defies the gray sky of the coming winter and the equally gray social climate. When Boston Gas sold to Keyspan in 1992, the original tank was torn down. But, due to its popularity, Kent’s mural was immediately repainted on a accompanying tank. Eltono’s art continues making the case for defiant joy, standing in solidarity just a few miles from Kent’s Rainbow Swash. In this season of anxiety and division, there is no greater protest than to stand proud and bright with joy and love. *Deepest gratitude to the many that helped us make this possible: Geoff Hargadon and Gary Strack at Central Walls; Michael Monestine from the Central Square Business Association; Amanda Hill, Pedro Soto and Al Wilson from Beyond Walls; Jason Weeks from the City of Cambridge; our artist assistants Lena McCarthy, Brian Denahy, Laura Menucci, Meghana Srinivasan, and Julia Roth; the many at IDEO that helped coordinate, paint and photograph, especially Christina Abele, Tiffany Knight, and Dirk Ahlgrim; and the architecture and interiors teams at Hacin + Associates. As an IDEO partner, Michael Hendrix leads the Cambridge studio and guides the firm’s East Coast-based Design Directors. Since joining the company in 2008, he has built a robust creative community and led key initiatives, most recently the redesign of IDEO’s global brand identity. Tiffany is a master of multitasking and connecting the dots behind the scenes for our leadership team in Cambridge. When she’s not planning logistics, you’ll find her riding around on two wheels, exploring new places near and far with her camera, cooking for her cooking club and playing in the dirt.